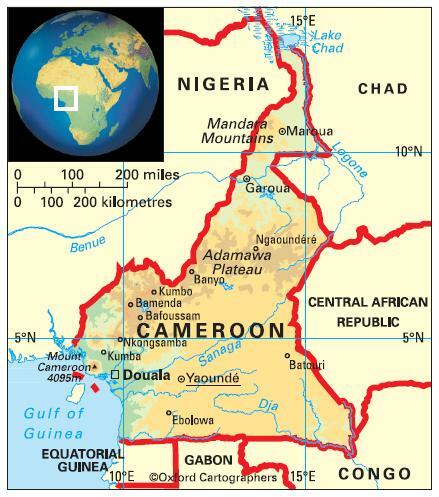 Cameroon is called Cameroun in French, Kamerun in German, Camarões in Portuguese, and Cameroon in English. The country’s name derives from camarões, meaning ‘shrimps’, so called by the 15th-century Portuguese explorer Fernando Po who named the River Wouri Rio dos Camarões (‘shrimp river’), after the many shrimps. Cameroon is in central Africa, bounded clockwise (from the west) by the Gulf of Guinea, Nigeria, Chad, Central African Republic, Congo, Gabon and Equatorial Guinea. The country comprises ten regions: Adamaoua, Centre, Coastal, East, Far North, North, North-West, South, South-West and West. In the northern Sahel region, there is a long dry season from October to April, with temperatures varying from cool to very hot. Further south, on the Adamaoua plateau, there are sharp drops in temperature at night. In the south the climate is hot and humid, with two rainy seasons, in September/October and from March to June. The most significant issues are overgrazing, desertification, deforestation, poaching and overfishing. 21,700,000 (2012); 53 per cent of people live in urban areas and 20 per cent in urban agglomerations of more than one million people. The population growth rate stood at 2.7 per cent p.a. between from 1990 to 2012. In 2012 the birth rate was 38 per 1,000 people (45 in 1970) and life expectancy was 55 years (44 in 1970). The population is ethnically diverse. In the north, the people are mostly Hausa, Fulbé (Fulani), Sudanese and Choa Arab. In the west, the Bamiléké are the biggest ethnic group, followed by Tiker and Bamoun. South of the River Sanaga, there are Bantu groups: Fang, Ewondo, Boulou, Eton, Bassa, Bakoko and Douala. Some pygmies (including Baka) live in the south-eastern forested country. Cameroon is classified as a lower-middle-income economy by the World Bank.